Being open to opportunity seems to be a big party of success. The big news during the 2015 NFL season was of course the teams on the field. But there was another big story that reached a boiling point after about 20 years. The issue was getting an NFL team back in the Los Angeles market. The questions swirled regarding the teams that would make the move and where they would call headquarters in the LA area. The names of the owners involved kept coming up in the news and that included Dean Spanos. So as I normally do I had to dig a little deeper into this Spanos guy. And it turned out that Dean’s father, Alex, was still the majority owner of the San Diego Chargers. Then I saw that Alex Spanos had started with an $800 loan and became a billionaire. I just finished the book and I’d like to share some lessons on life and business that I took away. If you like this sort of post then see my previous post on Sam Walton. I struggled with a way to say this one, but I think that is the best way: A business doesn’t need you. It’s something I’m trying to learn. Businesses do need leaders and Alex Spanos was the leader of his business. But the business he built ultimately didn’t need him in order to operate and to grow. That last part is something I’m really working on with GBW. Alex’s first business was selling sandwiches to farm workers in Northern California near Stockton. That business required him. He and his wife would make and deliver the sandwiches to the farm owners. After that business, Alex started a company that gave workers a place to sleep and eat while not working on the farms. This is when he started to create a business that didn’t need him. He would provide the insight, but ultimately other people operated and grew the company. The same with his construction business. He seemed to know from an early age that he had to leverage people and systems to grow a business. Maybe his businesses did rely on his leadership, but he was free from time constraints and able to be involved in any area of the company while leading. Alex seemed to live a life that embraced serendipity. Reading his book, it seemed like he was always open to what was going on around him. He never focused on what was wrong and what he couldn’t do. He instead focused on what could be done to change something for the better. In his sandwich business he would hear the farm owners complaining about not having enough work. Alex didn’t disregard this message and he found a solution. He also opened himself to listening to people in other aspects of life. He took meetings and listened. He didn’t act on everything, but he lived a life open to opportunity. He knew that was a key to success. The story of the farm owners telling Alex, then a sandwich maker, that they needed more workers seems pretty straightforward. They told him what they needed. But my guess is that the message was clear to Alex. I’m sure others would have missed it. The farm owners probably didn’t come right out saying that they needed more workers. They probably complained about needing to overwork their workers or not being able to get as much done as they would like. People don’t always tell you exactly what they want because they often don’t know. They know they have a problem. If they knew how to fix it they would probably do it themselves. Entrepreneurs are the ones that can read between the lines when people are expressing needs without saying it in simple terms. One of the best stories in the book was a story about Alex on a golf course. He fell in love with the game in his 30s and became a really good player, playing all over the world in all kinds of events and tournaments. But back to the story… He was golfing, I think, in Palm Springs and was just out there on his own. He was hitting balls on the range warming up and let the guy in the pro shop know that he wanted to join a group to play. That’s a step that again shows that Alex was always open to opportunity. If it were me I would probably look to play on my own. I need to break that habit. Anyway, the guy comes out of the shop and says he has a group and it turns out that it’s Bob Hope, Bing Crosby and one of their friends. So Alex got to play with those legends and actually went on to be best friends for life with Bob Hope. All from a chance meeting on the golf course. Golf is a good place to meet people. You can go on your own and meet new people. Even me, one that shies away from things like that, has been paired with others and you do get to meet quite a few people. It’s a good experience. You spend a few hours with the people and golf brings out the real character of a person. It will test your frustration and that’s a good thing. But you can do this off the course too. Open yourself up to meeting new people in situations that foster chance meetings. Alex worked for his father for a number of years. His father owned restaurants and bakeries. Never a huge success or anything like that, but for the early part of his adult life, Alex felt he needed to work for his father. That was a limitation that Alex put on himself. He finally broke free after approaching his father about a raise. His father’s denial was the final straw and Alex left and went on to great things. It might seem like his father was keeping him there and maybe in a way he was, but ultimately we all control our own destiny. We often put limits on ourselves. We are all what we do every day. If you don’t like your job then only you have the power to change it. Alex Spanos talks about risk quite a bit. He talks about it fondly in the sense that entrepreneurs are seen as those that take risks. They’re risk takers. They put something on the line in order for the possibility of a return. But something that also comes across in the book, that he mentioned a few times, was the idea of getting a good return for little risk. It’s a given that entrepreneurs need to take risks, but they don’t need to put it all on the line. In fact, many of the most successful people in history were the best at spotting close to sure things. Often, those things didn’t look like sure things to others, but the entrepreneurs were able to see the value. To Alex, it might be buying a piece of land that others overlooked. That limited his risk or buying price and he knew that even if it didn’t work out that he would still have an out. And he also saw the value in having cash. He took out loans for buying property, but he never stretched too far. And when economic conditions looked like they would change he would make sure he had huge cash reserves on hand so he could weather the storms. Throughout the book an underlying lesson is that relationships matter. Alex seemed to live his life as always being open to relationships. He met new people. He cherished the relationships he had with family and friends. Many of these relationships led to success in business. Others led to enjoyment in personal life. There is value in getting to know lots of people. You never know who will be your next best friend. One example of weathering a storm was when Alex Spanos sold assets to put cash in the bank. He did this so he could continue to employ his staff, the best people. He took care of people. He did it in many ways like charity, but what stood out to me was how much he cared for people. He provided jobs. He didn’t see life as taking things from people. He saw life as giving people opportunity and giving things to people that they needed to succeed…if they wanted to succeed. As you might imagine, Alex Spanos had a few tough business encounters. There were people that kind of double crossed him and things like that. And it seemed like Alex had a short temper, which he didn’t really like because he saw his father in himself that way. But Alex was good about not going to war. He didn’t hold grudges or it at least seemed this way. His energy was better spent on doing something good in the future. What’s in the past is in the past. Doing good things in life brings prosperity and happiness. Going to war with people brings the opposite. While he admitted to having a temper it also seemed like Alex Spanos appreciated laughter in life. He took things seriously including his relationship with Bob Hope, but he seemed to love how Bob would make him and everyone else laugh. Alex even had a dance routine with Bob. Laughter is one of life’s greatest gifts and it doesn’t cost a thing. There was a lot to learn from Alex Spanos. I could probably list another ten lessons or more, but these stood out as I finished the book recently. He seemed like a guy, just like anyone else, that noticed an opportunity and believed in himself enough to try things and to make the world a better place for people. 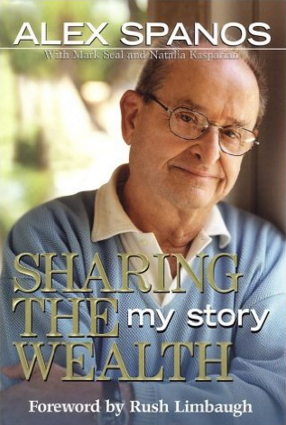 There may not be one secret to success in life, but when you read the stories of successful people like Alex Spanos you pick up on a few things.